What Happens when Markets go Mad. A gullible public, hungering for quick money with little effort, open to manipulation by clever promoters. All through history, one subject appears again and again. How to make a lot of money quickly! The first recorded case in England was that of a State Lottery in 1569. The tickets were on sale at the west door of St. Paul's Cathedral in London. The name of the winner is not recorded. In return for a loan of £7 million to finance the war against France, the House of Lords passed the South Sea Bill, which allowed the South Sea Company a monopoly in trade with South America. A much more recent example of madness was the events that led up to the Stock Market crash of 1929 and the Great Depression. The period from 1920 to 1929 is known as the Roaring Twenties. Those years were exciting, fascinating, and entertaining for the U.S. population, whose sons had just fought and won World War I (1914–18), the war that had promised to end all wars. Everyone was enthralled with the new gasoline automobiles that Henry Ford (1863–1947) had made affordable. Women had gained the right to vote, and some had acquired new electric machines that made life easier, such as washing machines and vacuum cleaners. Every day more Americans brought a radio into their homes; the radio brought music and news that thrilled listeners. The new moving pictures captivated audiences in palace-like movie houses. Businesses and manufacturing industries continuously expanded. The prices of their stocks steadily increased through the 1920s, going on a wild ride upward between 1926 and October of 1929. Stock prices went far beyond realistic values and had little basis in the health of the companies. These skyrocketing stock prices foretold of trouble for the U.S. economy. The crash of the New York Stock Exchange on October 29, 1929, signaled the start of the Great Depression, the worst economic crisis in U.S. history. This period would last until 1941, when the United States began preparations to enter World War II (1939–45). When the stock market began to spiral downward, many looked on in disbelief. However, others recognized that the plummeting prices were a confirmation of severe economic problems long in the making. For much of the 1920s the United States seemed prosperous. Many Americans were employed, and goods such as automobiles, appliances, and furniture flowed out of factories. Yet an undercurrent of unhealthy factors ran through the American economy—factors that all came together and surfaced in late 1929. During the 1920s there was no national economic planning or any significant watchdog agency to monitor the U.S. economy. The Republican administrations of Presidents Warren G. Harding (1865–1923; served 1921–23), Calvin Coolidge (1872–1933; served 1923–29), and Herbert Hoover (1874–1964; served 1929–33) followed a laissez-faire approach. Laissez-faire refers to the deliberate absence of government regulation. None of these presidents attempted to regulate the buying or selling of stocks and bonds; they exercised no controls over banking, manufacturing, or agricultural production. Likewise, no attempt was made to gather or analyse statistics that would have pointed to increasing problems in stock investing and overproduction of agricultural products and consumer goods. This approach to government was a major contributing factor in the Great Depression. Another general factor that contributed to the Depression was the "get rich quick" mentality that developed during the 1920s. Many Americans believed their fortune was just around the corner. This belief was fueled by the mass production of consumer goods, mass advertising in magazines and newspapers, and exotic silent movies telling tales of riches and success. With this "get rich quick" attitude, many Americans began to recklessly spend what little money they had. Hoping to look like glamorous movie stars, they bought a vast array of beauty products. On a larger scale many Americans purchased, sight unseen, parcels of land in Florida and southern California. When some investors went to visit the lots that had been purchased, they found swamps or desert. Realizing they had made a poor investment, many turned to the roaring stock market to overcome their losses. Focused on their own individual situations, these people did not recognize that their actions would soon combine with a number of other factors to produce the Great Depression. The Banking crisis of 2007………? had many all-too familiar roots. The crash originated in the United States, where the repeal of most provisions of the Glass-Steagall Act unleashed the banking industry to merge previously separate aspects of finance. The Glass-Steagall Act, also known as the Banking Act of 1933 was passed by Congress in 1933 and prohibited commercial banks from engaging in the investment business. It was enacted as an emergency response to the failure of nearly 5,000 banks during the Great Depression. The “victory” of US capitalism over the Soviet system, leading to widespread euphoria and the feeling that the world was entering the “American Century” To give a flavour of the atmosphere of the time, Francis Fukuyama wrote a triumphalist book entitled “The End of History”, which essentially claimed that a near-perfect system of (American) democratic capitalism meant that future change was unnecessary. Entry to the political arena of President Ronald Regan in the US and Premier Margaret Thatcher in Great Britain. These two politicians were utterly convinced that a new era could be ushered in by deregulating markets. They created the circumstances that led to the deregulation of the financial markets and a huge tide of privatization of industry and public services. After numerous attempts to repeal Glass-Steagall spanning the Bush and Clinton administrations, President Clinton signed the Gramm-Leach-Bliley Act that repealed the provisions preventing banks from affiliating with security firms. And used this money to push up house prices and speculate on financial markets. Every time a bank makes a loan, new money is created. In the run up to the financial crisis, banks created huge sums of new money by making loans. In just 7 years, they doubled the amount of money and debt in the economy. •	Around 31% went to residential property, which pushed up house prices faster than wages. •	A further 20% went into commercial real estate (office buildings and other business property) •	Around 32% went to the financial sector, and the same financial markets that eventually imploded during the financial crisis. •	A further 8% went into credit cards and personal loans. 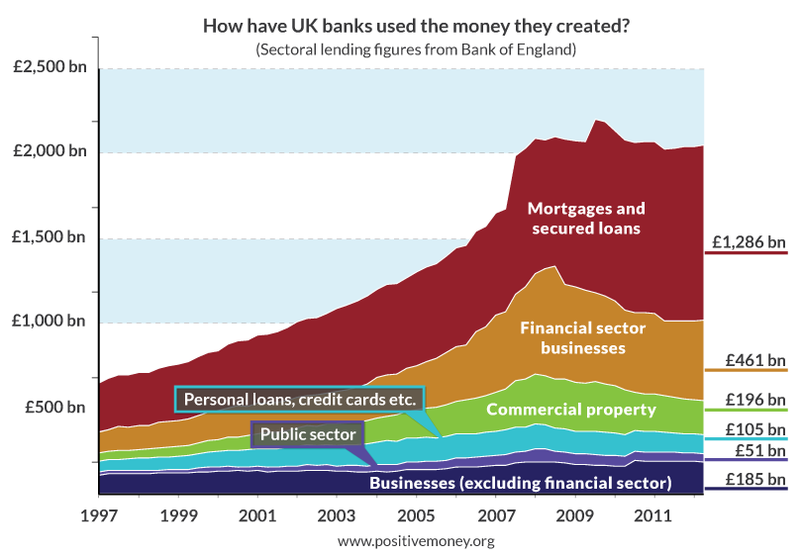 •	But just 8% of all the money that banks created in this time went to businesses outside the financial sector. The US government pumped money into the real economy through supporting unemployed people by providing a huge programme of infrastructure building (The New Deal). Government took action to bring the banks under control put the lid on irresponsible speculation. Banks were effectively split between retail and investment. Banks were prevented from indulging in share dealing. After the 2007 crash, little effective action has been taken to rein in the power of banks and huge corporations. The reasons for this appear to be the power of the finance industry and its symbiotic partners the large quoted companies. Their power and reach have assumed massive proportions, to the extent that as a result of political contributions and control of most of the media they are more powerful than the mass of the population and elected governments in Britain and America. Public money was used to bail out the banks that were deemed to be “Too Big to Fail”. 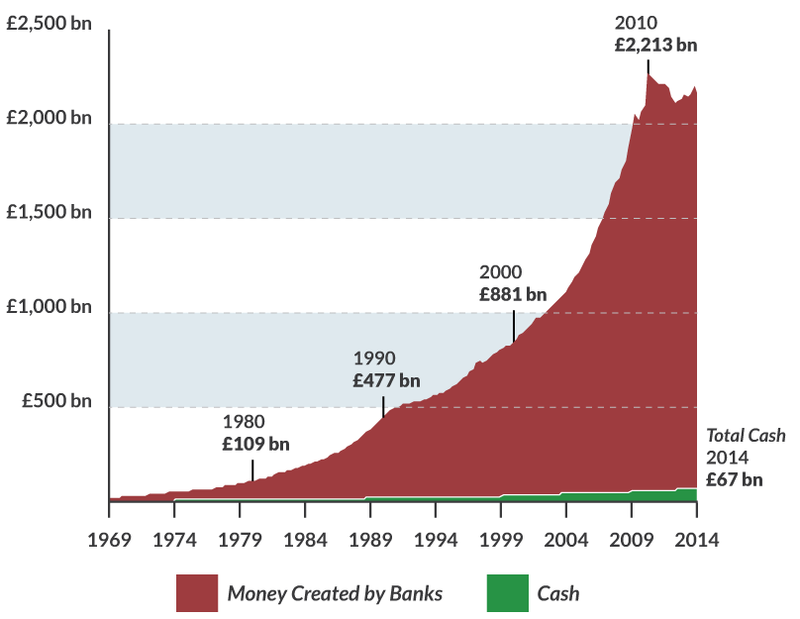 Central banks have pumped enormous amounts of cash into the banks in the form of “Quantitative Easing”. The intent behind this was to pump money into the economy to stimulate growth, using the banks as the chosen investment vehicle. Disgracefully, hardly any of this has got anywhere near the “real “ economy, instead circulating within the banking system, funding a housing bubble, and personal and consumer debt, bolstering the bonuses of top bankers and bulking up banks’ balance sheets. As a result, real economies have remained anemic since the crash, economic recovery is frail, and real investment remains very low. While this situation continues, the risks of further recession are high and the banks continue to speculate with public money. Lending large sums of money into the property market pushes up the price of houses along with the level of personal debt. Interest has to be paid on all the loans that banks make, and with the debt rising quicker than incomes, eventually some people become unable to keep up with repayments. At this point, they stop repaying their loans, and banks find themselves in danger of going bankrupt. This process caused the financial crisis. Straight after the crisis, banks limited their new lending to businesses and households. The slowdown in lending caused prices in these markets to drop, and this means those that have borrowed too much to speculate on rising prices had to sell their assets in order to repay their loans. House prices dropped and the bubble burst. Governments have failed to rein in the power of the global banks, which essentially remain free to trade in shares, make mortgage loans, manage retail banking and engage in the whole range of investment banking activities. Burgeoning Inequality of both earnings and wealth, adding to resentment and anger about “Them”. Trump in America and Brexit in the UK, both driven by anger on the part of a majority of citizens about being “left behind” by politico-economic systems controlled by distant power centres.